Buffalo Mozzarella on a pizza is amazing. I first had a buffalo mozzarella margarita pizza in Venice, Italy in 2012 at a restaurant my family just kind of stumbled upon. Hands down, the best pizza I've ever had. 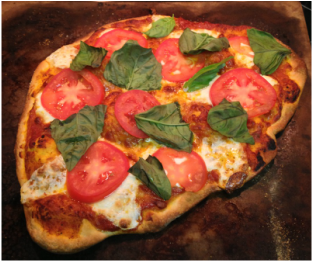 Margarita pizza doesn't quite seem like margarita pizza without buffalo mozzarella. Highly recommend trying buffalo mozz! Regular mozzarella works as well, but buffalo mozzarella is absolutely worth a try! I make my own tomato sauce, which can be found on my Spaghetti recipe. 5. Spread sauce evenly over dough. Add cheese. 6. Bake for 13 minutes at 500 degrees. 7. Add tomatoes to pizza and bake for another 5 minutes. Cheese should start to get a few brown spots. 8. Add basil to pizza. Bake for another 1-2 minutes, until basil starts to slightly wilt.